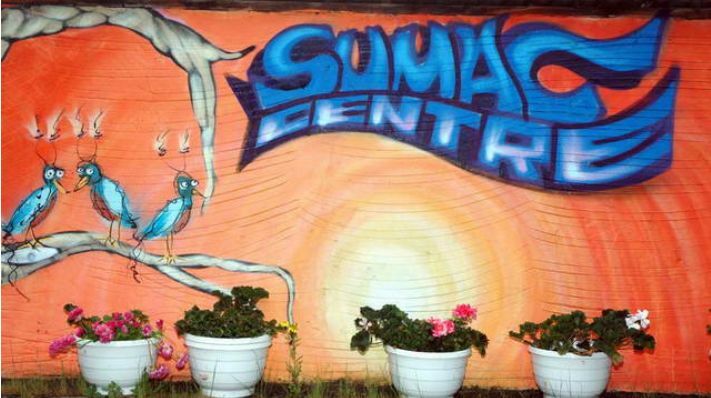 Last week gathered some 50 people from all over Europe in the terrific SUMAC Centre in Nottingham. 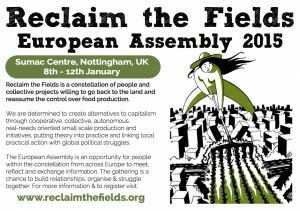 The topic for discussion: a new year for the European constellation of people and projects determined to create alternatives to capitalism through co-operative, collective, autonomous, real-needs-oriented small scale food production initiatives. We were met after a long journey from Scotland by a wonderful introduction into the history of the organisation. Here, we could clearly see how organised this self-run collective really is. We were issued FM radios so that we could tune in to real time translations into our own language. Supported languages were French, German and English broadcast from a translation desk that could have sat well in a scene from the French Resistance. Impressive stuff. After history introductions, we were invited to share what we hoped to get out of the meeting. I can happily say that it more than met my expectations – I learned exactly what I had asked for; how to link anarchist struggles to mainstream life in meaningful ways – and I think this feeling was mutual for all by the end. We were all deeply inspired into action and a number of working groups were formed. RTF Assemblies are functional meetings and they come with a rough outline for proceedings to include: workgroup discussions, thematic debate, local group project presentations, planning the next assembly and camp. With these points discussed, we have an international grass roots organisation running on the basis of face-to-face consensus discussions for the next year. Thematic debates this year were held under three titles; Radicalism Vs. Reformism, Access to Land and Urban Rural Divide. Whilst we will have to wait for the minutes posted for release in April to hear more details, the working group looking at access to land strategies formed under the debate of that title which I was part of. The debate was one of the highlights for me, and I think the other debates were equally invigorating judging by reactions once we re-joined the main circle. Summaries of these debate will follow in the full assembly minutes. RTF UK held a local group meeting within the Assembly. We discussed the need for skills in taking a land squat and infrastructure building skills. Several points came up as to how to attain these skills, not least a Farm Hackmeeting/presentation on the 18th/19th April and the Earth First Moots, the next of which is on the 20th – 22nd Feb and there may be another in August. 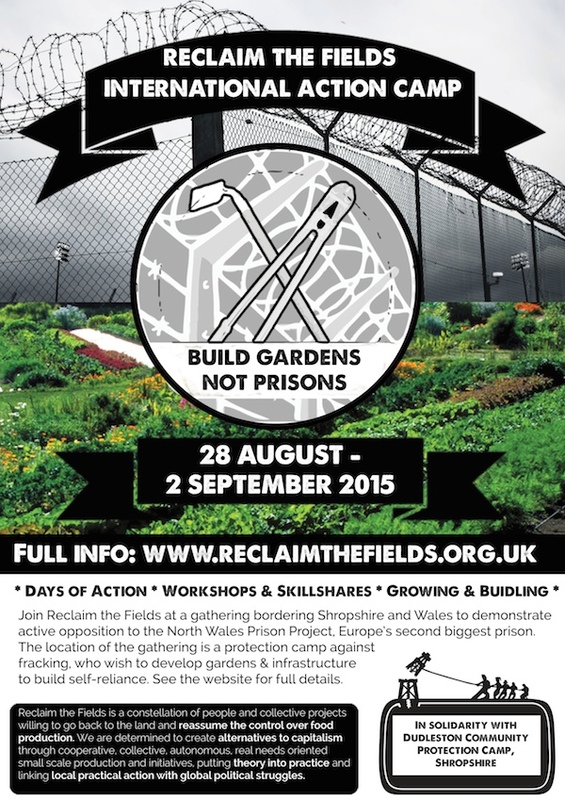 However, a major outcome of the Assembly was the decision to have an RTF Action Camp this summer in the UK. RTF UK discussed this and set up a Carrot group to oversee it’s organisation. Although this is very much still in the beginning of process, this could be seen as an opportunity for people to come together and practice this stuff first hand. 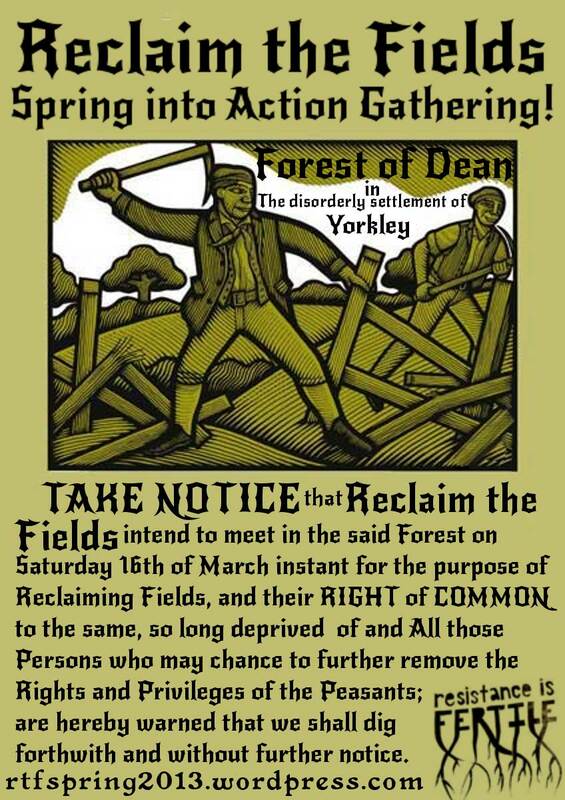 Another major outcome for the UK was that, without wanting to be specific, a local group in the North of England is planning an action early Spring, so be ready to lend a hand if the call goes out. On the evenings of Friday and Saturday we were treated to local group “Stars” presentations where those who have been organising in their communities got to talk about their successes and failures. While there is a lot I could cover here, and I will direct you to the 2014 Bulletin for more details, the following were the most informative for me personally and, I must stress, outlined very briefly. In Andalucía, Spain, a group called Can Piella with some direct support from an RTF camp had managed to occupy a piece of land for 3 and half years, until they were evicted dramatically after 7 months of resistance. After the eviction more people became active and a variety of new projects were started. The group reconsidered it’s approach and even bought a small piece of land with which to start community gardens and use as a base for expansion and proving their production ideas on solid foundations. In Vienna, Austria, an RTF group tried to occupy two bits of land on two consecutive years, planting seedlings and working hard to organise all for these attempts. However, both years they were evicted within ten days. However, this last year, they changed tactic and approached the local authorities for land. This they were granted but, happily, they haven’t been billed for the use of. They call it squatting ‘Vienna style’. On this land, with broad community engagement, they grew 40 varieties of potatoes! We were presented with a photo showing a veritable rainbow of potatoes. In Slovenia, a group of three academic students are attempting to bridge the gap between older and younger generations, seeking to maintain the flow of knowledge from old hands to new. With this central theme, they have built a structure whereby farm owners are now sharing their land with landless youth on the basis that it is used for production of food in polyculture. In France, La Zona a Defendre “la Zad” is a farm that was occupied after the threat of an airport construction roused local objection. This farm/community defence project saw off the airport project which has now been cancelled. The Zad now produces 15 tonnes of potatoes and 1 tonne of beans, amongst other produce, which is given away for free according to need. In exchange, the farmers get somewhere to live and food to sustain them. In these projects here mentioned and in others presented but not mentioned, such as Yorkley Court, a common theme became apparent. Local communities that directly benefit from the activities of these groups – in terms of community space and food products, etc – rallied around these groups in times of crisis and helped to defend them. Increasingly, local people are themselves becoming part of these radical struggles. 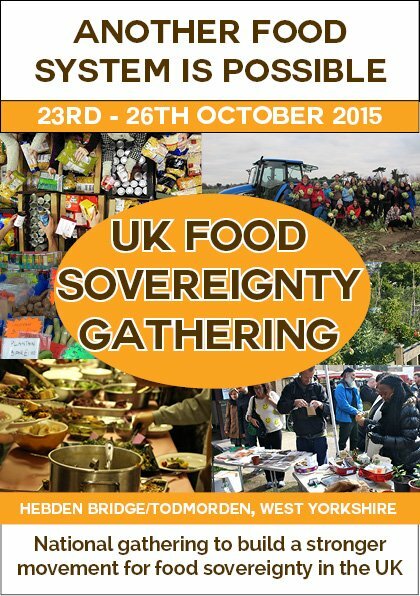 These positive responses from normal folk to the valued input of food producing peasant activists is a huge success. To me, this is hugely hopeful and represents an example of practical answers to the problems of today in action.. The next Assembly and Camp were planned in outline. We will have to wait for the Carrots to release more details as they are formalised as there are no solid plans yet. However, the UK is the likely place for the Action Camp this year. More detailed minutes from this 2015 Assembly will be released as a micro Bulletin in March, so watch this space.